...Festival Theatre, 9th and 10th July, which is right on the edge of (and indeed into) T in the Park territory. Evening News story here. Tickets available from Monday, and it's only an 1800-seater so be ready. And be ready for vast prices, too. The new stove is in! It was going to be thousands and THOUSANDS of pounds for a new Rayburn, and thousands more to have it connected to the (oil-fired) central heating system. After long and anguished conversations with plumbers and various other mystics, we settled on replacing the old,worn-out (rusted out) Rayburn with a stand-alone solid fuel cooker/stove. Still looked like costing megathousands, until a browse through eBay threw up this German Haas + Sohn range, new/old stock, half price, £599 with FREE DELIVERY (as far as Aberdeen). No back boiler, lacks the retro farmhouse look, but has a massive oven, burns peat and seems to be a default purchase for thousands of German families. A lot of people are moving back to solid fuel, I know, and it's interesting that eBay has become a forum for small firms importing European stoves that cost a fraction of the UK Agas and Rayburns (same company). I notice what looks like a Haas + Sohn with a back boiler that drives six radiators for £800, which is a snip. And there are Italian stoves available too. Anyway, whoever they are, the Outdoor Coooker Company came up trumps for us. Anyway, many thanks to Northwards Shipping for whisking the stove up from Aberdeen and onwards to the house. The driver, James and myself got it in without anything like the hassle we had in removing the Rayburn. Duncan has just fitted the flue, and once the fire cement dries, we're ready to rock'n'roll. I think it looks great. Tomorrow we'll know if it works! I've been aware for some time of the existence of several other Tom Mortons working in what might generalise as 'the media.' This one broke cover the other night in Channel Four News. He appears to be some kind of advertising guru. There's another TM in Australia, a broadcaster and writer, oddly enough, and I once appeared at book reading in a school to find a display of one of his books artfully arranged behind me. There's a dead Tom Morton, acclaimed painter; and there's Tom Morton the curator of the Cubitt Gallery in London, also a writer. It may have been one of these TMs or a different one entirely who wrote an article recently for MicroMart about gaming, thus occasioning my father to get in touch, anxiously wondering how I'd acquired all this abstruse knowledge about Grand Theft Auto and the like. Thing is, though, should I change my name to avoid confusion? Is it up to me? Who am I, anyway? Thomas MacCalman Morton is my full name. How about T MacCalman Morton, a soubriquet I have used on occasion when wishing to appear pretentious. Or Tom MacCalman Morton. Or, to return to the name I was universally known by until university, Tommy Morton? I always knew that removing the old Rayburn Supreme range from our kitchen was going to be a serious piece of heavy metal motion. Had to be done, though. The thing is over 40 years old, the seals have gone, it's lately been refusing to burn properly (solid fuel; peat, natch) and sometime this week a new, eBay-purchased Haas &Sohn cooker will be arriving to take its place. At roughly one quarter the cost of a replacement Rayburn. 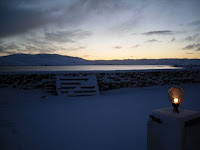 We have free fuel, courtesy of our peat banks, and while it would be nice to try and run our central heating system from peat, the cost of doing so was going to be astronomical. Not to mention persuading a plumber to actually do it. So we're simply installing a solid-fuel cooker. 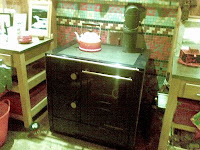 The Haas & Sohn is not the couthy, retro, gorgeous thing a Rayburn or an Aga is. It's a somewhat prim, teutonic, angular item. But it was cheap and it allegedly works very well. It will take the edge off the manse's essential presbyterian chill, cutting down the oil bills. And I'll be able to bake bread in it. Our old Rayburn has some tales to tell. It allegedly provided succour from two-foot deep flooding for two men working on the manse during the great tidal surge of 1970-something. It is the most hideous colour ever designed by Aga (brown fading to grey; it's called sable) and we once got the oven so hot during a storm it cooked a pizza from frozen in 30 seconds. Truth to tell, it has been a good old friend in times of great freezingness, especially during power cuts. But it's not going far. In fact, it's so heavy I can't see it being possible to move it far, unless I smash it bits first. The idea is to turn it into a kind of outdoor kiln/oven, for super-lengthy peat-fired cookathons involving bits of sheep, cow, goose or hen. The big Lerwick Up Helly Aa is past, but our own not-so-wee local one happens tonight, with vikings, guizers, the burning of a galley and partying until half past dawn. Or,in my case, bedtime. Time for a few snifters and my annual venture into the abstruse world of the St Bernards Waltz and the Boston Two-Step. Mind yer tootsies! Come on, it was only a quarter of a century ago...thanks to Stewart Cunningham for digging out the photies. And to Phil Blakeman, David MacLachlan and Alex Smith for the memories. This video most certainly does not show me abusing the car I've had on rental for the past three days. However,I can unreservedly recommend the Skoda Octavia 4x4 Tdi. 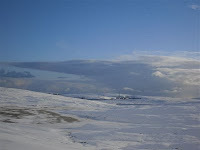 It was absolutely brilliant in all the snow conditions I encountered, from two-foot deep drifts to packed, icy surfaces. Why has nobody told me about this thing? The four wheel drive system is permanently engaged, so there are no diff locks, lower ratio levers or other fiddly bits. Instead, something computer-controlled called a Haldex Clutch electronically senses how much power to send to which wheel. So on dry tarmac, as much as 90 per cent of your traction may be at the front. In dire straits, it can send 85 per cent to a single wheel. It's the same system as found on Audi Quattros and TTs. Not to mention VWs. But then Skoda is owned by VW, and the Czech factory is reputed to have the highest standards of any in the group. No surprise, really. Long, long before the name 'Skoda' became a joke, Czech technology was allegedly ripped off by Dr Ferdinand Porsche to produce the original Beetle and Porsche designs. Classic VW interior, reeking of quality. Incredibly boring bodywork. I've been told that adding Vredestein SnowTrac winter tyres turns the Octavia 4x4 into the perfect Shetland car, and I can see no reason to disagree. ...you phone Bolts car hire. Actually, all the car hire companies in Shetland have always, in my experience, been excellent to deal with. But I have a soft spot for Bolts because they supplied the first car I ever drove in the islands, more than 30 years ago. It was an old-style Mini 1000, I was a young reporter, Shetland was in the midst of an oil construction boom which made the whole place look like a building site, and I thrashed that wee thing through mud, slurry, peat and ice for a week, until nothing on it worked except the gearbox and engine. I said no more snow pictures: this doesn't count, as I stole it from the Auto Express website. I'm picking up a Skoda Octavia 4X4 ("impressive in snow") after the show, as by that time Susan will (hopefully) have made it home in the Toyota. The schools are closed and the weans are at home with chicken goujons to defrost. Anything could happen! I need to stay on late in Lerwick as tonight as I'm hosting BBC Radio Shetland's Speakeasy programme, on the subject of Shetland's music scene and its future. By that time I'll have missed the last bus, and there's a good chance in any case that it won't go. Because today, Day Six of Snow Go Zetland, is the worst so far. The road south from Hillswick was blocked earlier, but we managed to follow a snowplough out. I was intending to stay in Lerwick overnight, but a look at hotel prices (and, for that matter, some of the visitor comments on TripAdvisor) convinced me the money would be better spent on hiring a 4x4. And, let's face it, for a petrolbrain like myself, it will be more fun. 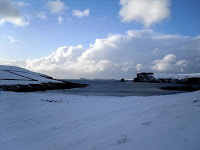 Tricky old trip into Lerwick - Scandinavian conditions, with hard packed snow on the roads most of the way. But the Toyota did what it undoubtedly says on its tin, thanks to the BF Goodrich All-Terrain tyres (actually, the original ones were rubbish). 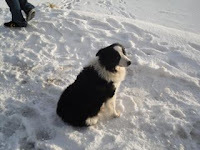 Dropped Susan at the hospital, then up to North Eastern Farmers for dog and cat food in bulk. 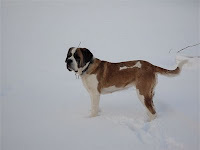 When you have a St Bernard, bulk is the only way. Tesco for basics, and then to BBC Radio Shetland. Good and very busy show, main theme being the nostalgia of smells. Some fantastic tales...you can hear it for seven days here. Drove home alone, as Susan had to take one of the NHS Subaru Foresters up for her associate to use. Great cars, wish I still had mine. 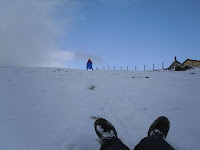 Arrived to find a blizzard and both weans (18 and 14) engaged in a sledge race. More of this tomorrow, but frankly, that's enough snow pictures. So, it's the Landcruiser or the public pantechnicon for the trip to Lerwick! All will depend on whether Susan has to go in to Lerwick or not. The Citroen ain't built for these conditions. Radios Ian (SIBC) and BBC Orkney both carried the school closure announcement - a perfect example, as Susan pointed out, of community FM, as opposed to digital radio, in action. 'Not everyone has a computer.' Quite. And DAB - Dead And Buried - disnae work here. Steam radio saves lives! Or at least gives the kids a long lie. 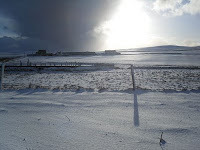 More snow showers promised, and frost. But still, it's an absolutely gorgeous morning. A privilege to put the esse bags out. 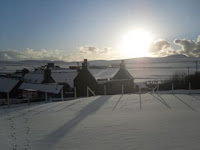 A glorious day of bright sunshine and snow, though things are now looking a bit iffy for tomorrow. 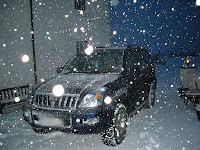 It's snowing heavily and tomorrow I'll either have to cadge a lift to Lerwick with Susan (and her Toyota Landcruiser) or get the bus. Either way, excitement is promised! 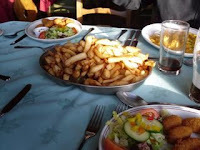 Today, though, we stayed put, with a couple of minor-league dogwalks and a fine lunch at the St Magnus Bay Hotel, where the chips are particularly wonderful and the portions are massive. I love scampi. A game of pool, a pint of Belhaven and two perfectly friendly sheepdogs on the lawn. Tomorrow, though, may (will) be quite another day. Brutally cold, ice on powdered snow, and very windy. Don't let the brightness fool you! Now, after dark, the wind is really gathering force. We've already had one power cut, both the peat fires are on, and both tomorrow and Monday are looking grim. And yet.. Right, that's it. No more bohemian hippy trail camper van fantasies. It's over. 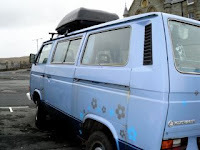 Having said that, the venerable VW started instantly this morning and ran faultlessly on the 37-mile trip into Lerwick, through some fairly nasty conditions. But it was with a sense of relief that I handed over the keys to NorthLink's freight staff. All being well, the VW will be on the Hascosay freighter tonight and in Aberdeen tomorrow. There Kerry from Harrogate will, I hope, pick it up and make her way safely back to Yorkshire. There is the little matter of the snow, but it's extreme climactic conditions that turn eBay collections into major adventures. It was at this time of year that I picked up a Citroen 2CV in Tonbridge, Kent, and drove it back to Shetland. The fact that it was freezing cold, the 2CV had holes in the roof and there was no functioning heater just made it more...memorable. Speaking of Citroens, the less-than-a-year-old Citroen C4 has a broken heater. The fan (without which there IS no heater) only works in the full-blast position, which is unbearable for more than about a minute. Should be fixed tomorrow, but it's been incredibly annoying. Meanwhile, the K-reg Volvo Torslanda is in the garage for a new water pump and general fettling in advance of its MOT. Its heater still works fine, but then those old Torslandas had beefed-up internals to cope with Swedish winters. And probably the best seats in any car, ever. This scene was actually much more impressive just before I managed to stop and take the snap. I was talking to someone the other day who has given up on landscape and seascape photography in Shetland as he's fed up with it...and it's true that living here, you do risk becoming inured to the spectacular sights around you. But surely not completely? 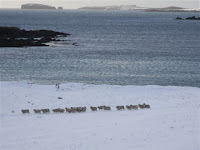 Meanwhile, travellers to and from Shetland by sea continue to suffer. No boat expected until this afternoon (only one running) after the Hjaltland failed to get into Aberdeen Harbour yesterday (abnormally low water in an easterly wind = no entry to (quite) big boats) and subsequently docked at Rosyth. Passengers travelling north last night had to board at Rosyth, too. Good show yesterday, with all the talk about 'Australian English' and that continent's poisonous pests. And really enjoying the album of the week, You Heard It Here First, a compilation of the original recordings of songs made much more famous as covers. Thanks to Rocky for sending it to me. Arrived safely in Lerwick after a 14-and-a-half hour trip from Aberdeen via Kirkwall...pretty impressed that the Hjaltland left on time, though, as she was apparently sitting off Aberdeen until after 1.00pm. It's all a bit of a mess at the moment, with the other ferry, Hrossey, in for her scheduled drydock inspection (following repairs after her encounter with a Very Large Lump of Water last week, leaving the Hjaltland (fresh from being bashed about by a freak wave two weeks ago) sailing from Aberdeen to Shetland only every second night. In fact yesterday's sailing was the first to reach Shetland since Friday due to the Hrossey's mishap. That means there's a dangerous lack of fresh Tesco sushi and Co-op sun-dried tomatoes, not to mention 'sooth bread' (that evil substance made with wallpaper paste and preservative. Last night's boat was rammed with trailers packed with these delights, so all will be well, at least from a dietary point of view, from today. It was an annoying, uncomfortable trip - I couldn't face another Phenergan anti-histamine hangover, so relied on lasagne and chips to settle my stomach (worked a treat). Forgot to take Dan Holland's lifeboat-tested advice and get some ginger nut biscuits. But it was very difficult to sleep as the boat pitched and rolled and slammed into the big seas left from the weekend's storms. Still, I finished John Niven's scabrous (and frankly mind-soiling) but admittedly funny Kill Your Friends, Martin Amis's Money rewritten by a Viz fan from Irvine who likes Idlewild. AND Stieg Larsson's The Girl Who Played With Fire, sequel to The Girl With the Dragon Tattoo which I liked but did not love; though it's a very interesting approach to the Scandic Noir form of crime novel. I may write more about it later. Still, I'm here, at least I didn't have to deal with the execrable Flybe: Susan spent much of yesterday trying to book flights for her, Martha and a cello. An extra ten quid to put the (very valuable and delicate cello) in the hold. A seat(for the cello) for 10 per cent of the human price, said the first lady. No, full human price, said the next one. No, seven quid more than that, said her supervisor, as you booked your human seats online, and now you're on the phone. And this for unchangeable, no-refund bookings. 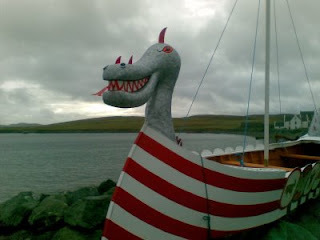 NorthLink may have its faults, and the Hrossey and Hjaltland are far from ideal for this lifeline service, but its (Orkney-based) bookings staff are unfailingly polite and helpful. And you can change your booking any number of times at no extra charge. Plus, the lasagne and chips last night was very good indeed.